Besides the financially savvy or those predispositioned to be accountants, who really enjoys making budgets? No one! If living paycheck by paycheck, worrying about paying your bills, coming up short, stress, and the inability to save for those higher ticket items such as vacations is a lifestyle you enjoy, by all means, skip the budget. If your dreams, however, are greater than that, then making a budget is one evil that you cannot avoid. Do not be alarmed, the budget project is not as difficult as one might think. A person’s budget starting point should always begin at income. 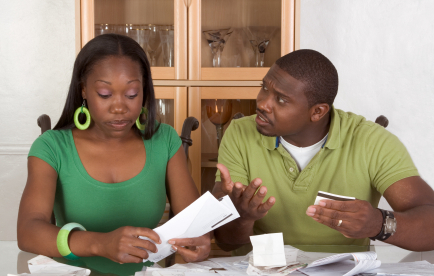 How much money is coming into your household? Start with the total dollar amount as the top line item. Next, list your bills as individual line items. Go through your bank statements and check to see what the absolute most is that you spend on all of your bills. Be sure to include water, sewage, natural gas, cable, phone, electric, entertainment, grocery, loan and credit card payments, charitable contributions, car and mortgage payments, insurance, gas, and anywhere else your money goes on a regular basis. After one determines where there money is going, they should then determine how much income they have left over. It is important to only spend 90% or less than your monthly income; save the other 10% in an emergency fund. Check for luxuries disguised as necessities, this may be where precious dollars can be saved. For example, your cable could be reduced to a basic plan, or you could live without cable at all. Is it really necessary to have a home phone and cell phones? Also, be aware of unnecessary cash leakage. It is easy for those little ATM fees to add up, or those 411 calls. Stop handing your hard earned dollars over to fees and charges. Last, do not count on year-end bonuses, and cost of living pay raises. Bonuses are never guaranteed, and neither is employment. Cost of living pay raises are for just that, inflation and ever rising gas prices. Live off of what you make now, and anything else count as an extra blessing.